It’s her 21st birthday today! Which calls for a celebration, preferably with lots and lots of 肉 in lieu of cake. I think it’s fair to say Tenchan is the major reason why my interest in seiyuu has revived, something that I’d never imagined remotely possible only as recently as January when I was still thick in amongst the Sone fandom. Of course I was aware of her as one of the Sphere quartet’s kouhai and that she looked a heck of a lot like Tomatsu Haruka, but I totally wasn’t paying attention to any of her work, especially not when the buzz was tied to a game franchise I have no interest in. The turning point came with Isshukan Friends. – as soon as I heard the ending theme, I was falling for her hook, line and sinker. I am extremely partial to seiyuu who can sing well since that is what actually got me interested in them in the first place – you can thank Iwao Junko and Yokoyama Chisa for that one. The comparison of Tenchan to Harukas is not going to go away any time soon; the two of them are so similar in so many ways, yet so obviously different in others. Obviously they share similarities in looks and in terms of their role within their respective generation of MuRay idols – to borrow a term from the Kpop scene, both of them would function as the ‘visual’ of their groups. As for differences, singing ability is the most apparent with Tenchan being about 20 times a better singer than Haruka ever will be, which should make her an easier sell as a seiyuu idol. When it comes to voice-acting Harukas has the advantage and also the benefit of a huge, varied body of work that shows off her versatility but lest we forget, her debut in Polyphonica was no great shakes and it wasn’t until Kannagi that people actually stopped hating on her (yes, lots of people hated her…). So far Tenchan hasn’t done anything remotely challenging except maybe Tokyo Ghoul’s Touka, but she is landing a lot of lead roles left and right so I expect we’ll get to see the full range of her acting sooner rather than later. Whatever reasons MuRay may have for pushing her hard what with all those radio shows and hosting jobs and best of all, Ohitori Summer, it’s definitely a great time to be a Tenchan fan. What a great 20th year it has been for Tenchan herself, and may her 21st (and 22nd and so on) years be even better! This entry was posted in Amamiya Sora on August 28, 2014 by admin. Before becoming a seiyuu, Kakazu worked as a small-time reporter in a period that she describes as ‘2 blank years’. After joining the Genki Project agency, she made her voice acting debut in Gundam X as Sala Tyrrell in 1996 and slowly built up her popularity through roles in Yu-Gi-Oh! (Mazaki Anzu), Houshin Engi (Dakki So), Initial D (Sayuki), Vandread (Dita Liebely) and Ayashi no Ceres (Mikage Aya). Kakazu also started hosting a programme called Kakazu Yumi no Kagayake! Yamato Damashii on AM Kobe Radio in 2001 which then shifted to Yotsuya-shiki net radio hosting after the end of terrestrial broadcast in 2002. In 2003 the show was renamed Kakazu Yumi no Chou-Kagayake! Yamato Damashii!! and shifted from Anista.TV to Onsen.ag in 2004, where it remains hosted today with over 550 episodes broadcast. 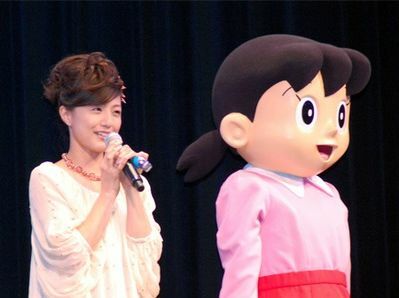 The high point of Kakazu’s career came in 2005 when she was chosen from auditions for the role of Shizuka in a renewal of the beloved Doraemon series. She took over the character from Nomura Michiko, who had voiced Shizuka for 32 years (since 1973) and was herself a replacement for original seiyuu Ebisu Masako. In June 2004 Kakazu announced that she had gotten married. Her husband was a former classmate, and in August 2005 she gave birth to their first son. The couple had a second child, also a son, in 2008. However, on what would have been their 9th wedding anniversary in 2013, Kakazu announced on Twitter that her husband had in fact passed away from a brain haemorrhage 3 & a 1/2 years earlier, but she assured fans she was doing well. These days Kakazu is signed to the Atomic Monkey agency alongside the likes of her Doraemon co-star Seki Tomokazu and Orikasa Fumiko. She is also involved with a non-profit organization called Koe to Mirai that aims to provide child care support and develop human resources through the power of the voice; organizing mini concerts and family day events, picture book readings and providing lessons. The project is the brainchild of a group of entertainers who are also parents, led by veteran seiyuu Aikawa Rikako and her husband Iwata Mitsuo’s cousin, musician Takayanagi Chino. Other seiyuu involved include Nojima Kenji and Itou Miki. Additionally, with fellow seiyuu friends Orikasa Fumiko, Ohara Sayaka, Toyoguchi Megumi, Asano Mayumi and Kikuchi Shiho, Kakazu has formed an informal ‘Kimono Club’ to extol the virtues and beauty of the Japanese traditional dress. 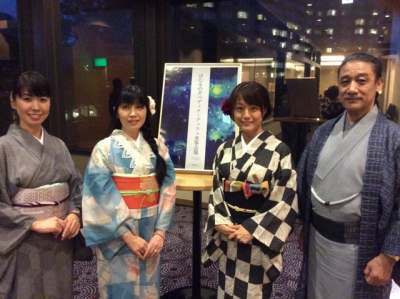 Above, she is pictured in kimono with (from L to R) Mitsuishi Kotono, Kawamura Maria and Ginga Banjou. This entry was posted in Kakazu Yumi on August 7, 2014 by admin. FYI, the role went to Saitou Kei. Almost 10 years on, what are these 10 girls doing? Let’s take a look at who made it and who didn’t. 1. Nakai Erika – Signed to the Toritori Office agency, Nakai’s most well-known role is as Eila in the Strike Witches series. In 2009, Nakai changed her stage name to Ohashi Ayuru and has since signed a recording contract with Wisetone, releasing 1 album, 7 mini-albums and in July 2014, a best of compilation. She has also landed supporting roles in the Saki series (Sawamura Tomoki), Love Live! (Yuuki Anju), Girls und Panzer (Nogami Takeko) and Kyoukai Senjou no Horizon (Adele). 2. Kimoto Orie – She had already done seiyuu work before auditioning for SPEED GRAPHER, but was mainly a stage actress. Kimoto has a solid if unspectacular CV, with the Precure series’ Hyuuga Saki/Cure Bloom/Cure Bright being her biggest role. In 2010 she announced her marriage and pregnancy on her blog. Kimoto hosts the annual Yoninde SUPER☆TEUCHI☆LIVE events with her Precure Splash Star colleagues Enomoto Atsuko, Gojo Mayumi and Uchiyae Yuka, and in 2012 and 2014 she surprised fans with the announcements of the birth of her second and third children. 3. Miyazaki Ui – Miyazaki went on to sign with RAMS agency and had a productive period both as a seiyuu and a singer, solo and as part of the unit Clover. She left RAMS in 2013 and signed up with 81 Produce, but very little has been heard from Ui since with her blog and Twitter both strangely silent which has led to fans speculating on her possible marriage and pregnancy as a reason for the inactivity. 4. Soda Miho – She was signed up by Avex Planning & Development alongside the likes of Chihara Minori and Hirama Juri, the former of whom Soda is good friends with. After only a handful of minor roles in anime and games, Soda retired from voice acting in 2007 and became a psychotherapist. 5. Kodaki Izumi – Did not pursue voice acting. 6. Ikeda Sayaka – Now a tarento doing CMs and acting after winning an audition for a Tokyo Seleccion Deluxe stage play in 2009. You can see a video of her in a 7-Bank ad here. 7. Saitou Tomomi – Did not pursue voice acting. 8. Fujita Sakiko – Fujita was already an active rookie seiyuu when she auditioned for the role, having won an award in Pony Canyon auditions while still attending Nichinare voice actor training school. She changed her stage name to Fujita Saki in September 2005 and started winning roles in shows such as Tsuyokiss, Tokimeki Memorial and Manabi Straight!, but it wasn’t until in 2007 when she was hired as the voice of VOCALOID2 Hatsune Miku that her career truly exploded. Saki now appears in many anime and games with the most recent standout title on her CV being the Kantai Collection series. She is scheduled to voice Akagi in the anime next year. 9. Iguchi Yuka – I don’t think I really need to say much about Iguchi. She was already active as a seiyuu, albeit a very young one, by the time she auditioned for SPEED GRAPHER having already won a role in Di Gi Charat a couple of years earlier. Needless to say, Iguchi went on to bigger and better things despite not making the grade for the Gonzo production and today, she is one of the finest seiyuu in the business and is still only 26 years of age. 10. Saitou Kei – The eventual winner despite picking up the lowest number of public votes, she changed her stage name to Shindou Kei in October 2005. She has continued to work steadily with some popular roles including Kodomo no Jikan’s Kagami Kuro and Hanamaru Kindergarten’s Anzu, while recent roles include Galilei Donna’s Hazuki Ferrari and Wizard Barristers’s Hotaru Natsuna. Her career has never really hit truly great heights though. This entry was posted in Fujita Saki, Iguchi Yuka, Ohashi Ayuru, Shindou Kei on August 4, 2014 by admin. Although never quite achieving leading man status, Takewaka voiced a few significant roles during the short period he was active. His breakthrough came when he voiced Amon in Witch Hunter Robin, and he followed up by voicing a wide range of characters such as Ogawara Ryohei in Jinki Extend, Morita Kaoru in the Honey and Clover series and Suleyman in Trinity Blood. He was also very active in dubbing drama, being involved in long-running series like CSI:Miami (Eric Delko) and The Closer (David Gabriel). 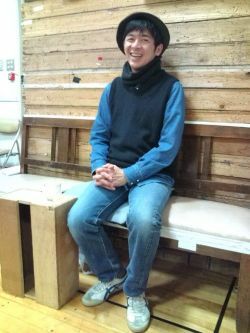 After a puzzling period of inactivity in 2009, it was revealed on Theater Echo’s blog in December of that year that Takewaka had suffered from a brain haemorrhage on 10th April after collapsing while on his way to work, for which he underwent surgery and was thus hospitalized up to September. It was also mentioned that he had been undergoing rehabilitation at home as he was still suffering from paralysis caused by his condition. Since then there have only been brief mentions of Takewaka on the theater group’s blog, but he is still doing some work in the form of audio drama lives. Some of his roles (ie Higa Izumi in Sekirei) have been recast and as of 2014, there remains no sign whether he will ever be in any shape to make a comeback to the seiyuu business. This entry was posted in Takewaka Takuma on August 4, 2014 by admin.